The task of theology is ultimately the task of speaking about God after God. Attempting to do so is wrought with difficulties. Readers of this blog will find other, more eloquent posts detailing the problem of theological speech; human contingency and “violent” metaphysical systems are some of the endless curveballs sent our way today. In response to these difficulties, at least one natural response is to lament and adandon theological speech altogether. Further, the immensity of the theological task is always rendered heavily on those who seek to pursue the discipline. I (hope I) am not alone in feeling woefully deficient in “doing” theology. Graduate school daily reminds me that the more I learn, the more I learn I do not know anything. Pressure is mounting to position myself for post-graduate work. Peers seem to grasp the specifics of medieval and modern thinkers much better than I. The pressure was rendered more acute by Barth’s sense of intellectual inadequacy: in another circular letter in late January of the next year , he speaks with dismay of his lack of scholarly agility, his unsatisfactory knowledge of Latin and his poor memory. We speak because the Word has spoken. This does not make the task easy. An ever-changing world requires various modes of witness to the one God. The jury is still out on just what the next dominant expression of doctrine will look like. I take solace in imperfect proclamation of the Word, something always both possessed and unable to be possessed by the church, the divine Subject and Object we continually bear witness to in inadequate yet faithful ways. John Webster, Barth’s Earlier Theology. In his essay “The Word of God as the Task of Theology,” Karl Barth attempts to put forth the task of the theologian. The task that is both the theologians plight and promise. This task, the theologians plight and promise, is both the necessary and impossible task of speaking of God––the question of God. For Barth, the question of God arises from human existence. This question comes to be from the human realization that her entire life stands in the shadow of death. Thus, this question that gives rise to the theologians task, the question of God, is the negativity of human existence. “For [she herself], the human, is the question. Therefore the answer must be the question.” It is out of this negativity of human existence that, for Barth, both the question and answer of the task of theology surfaces. However, this task is an impossibility, according to Barth. The answer to this question, to the “human riddle”, is the Word of God; it is the event of God doing something new. It is the event that cannot be comprehended; it can only be revealed as the impossible becomes possible, as God becomes human. Nevertheless, this question, which rises up in the need of the human, moves one to “ought” to speak of God. However, this ought does not imply can. 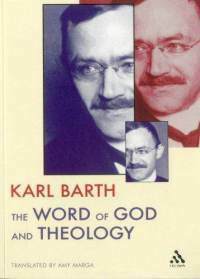 For Barth, “to speak of God would mean to speak that word which can only come from God [herself]: the Word, God becomes [human].” It is only as God reveals Godself that the Word may be spoken. Where God enters into the negativity of our existence with Her fullness, it is only there that speaking of God may occur. We humans cannot speak of God, but because God has become human, we may speak of God. However, we are to do so in a way where the answer is never dissolved into the question, nor vice versa; rather we are to speak “along this narrow ridge” of answer and question, of ‘yes’ and ‘no’. Thus we are to speak of the Word of God, “the living truth”, in awareness of the “unavoidable absence of this living truth” in all our sayings. The task of the theologian is to say that which cannot be said, to speak of God. And in faith, the “plight is also the promise”. For in faith, “it might be possible that the Word –– the Word of God that we will never speak –– has taken our weakness and perversion, so that our word becomes capable of the Word of God precisely in its weakness and perversion.” The question is the answer because we have faith that in the negativity of our existence, God, in God’s fullness, will speak the Word of God. Barth, Karl. Word of God and Theology: “The Word of God as the Task of Theology, 1922,” 185-186. For Barth, this question comes out of humanity’s cry for salvation. “The human does not cry for solutions, but for salvation; not for something human again, but for God as the Savior of his humanity.” Ibid., 179. “…even in the precise moment of the divine calling and equipping, we still cannot speak of God.” Ibid., 185.